Sometimes when I have a quiet weekend coming up I get the notion to make a big batch of some kind of relish, chutney or jam and fill up all the empty jam jars in my press. 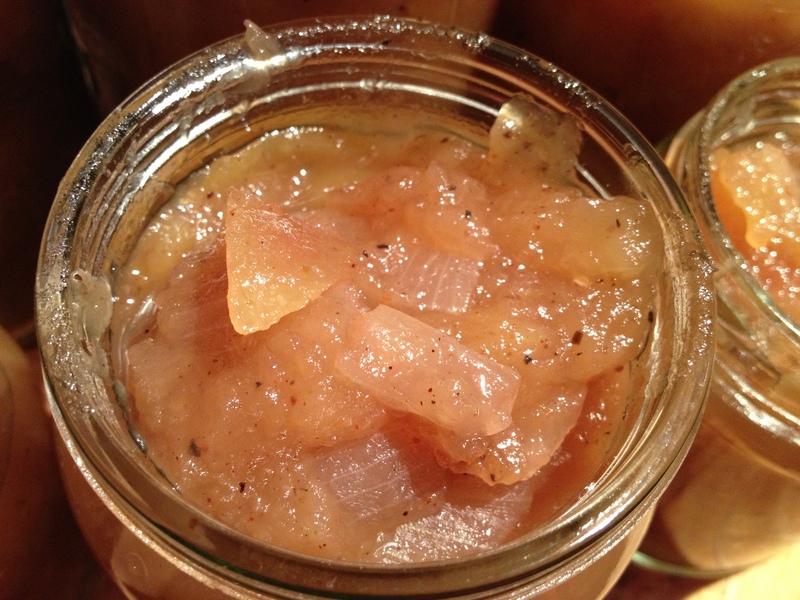 This weekend I decided to make a batch of Sweet Apple Relish. 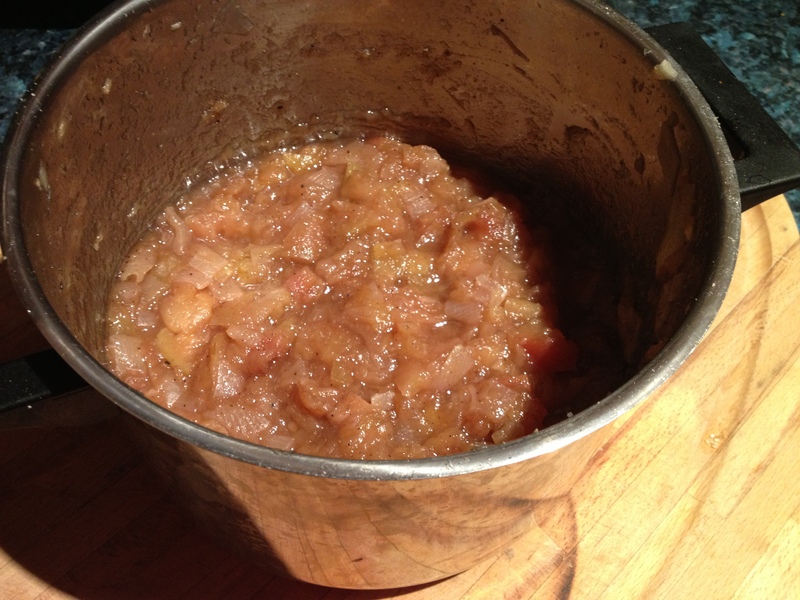 The last batch of Tomato Relish I made was a hit with friends and family but I’m down to the end of my last jar, and thought that this time around I would make a batch of apple relish. I’m sure pretty much every other 24 year old was doing something really exciting last Saturday night, but alas, I was making relish. And what’s even worse? I did find it really exciting! Relish is really, really easy to make. It’s cheap, takes minimal effort and really adds great flavour to your everyday sandwiches, quiches, fry ups, omelettes… pretty much anything that could do with a kick. I went to the Glasnevin Farmers this weekend and came across a lovely woman selling the most delicious fruit and vegetables. 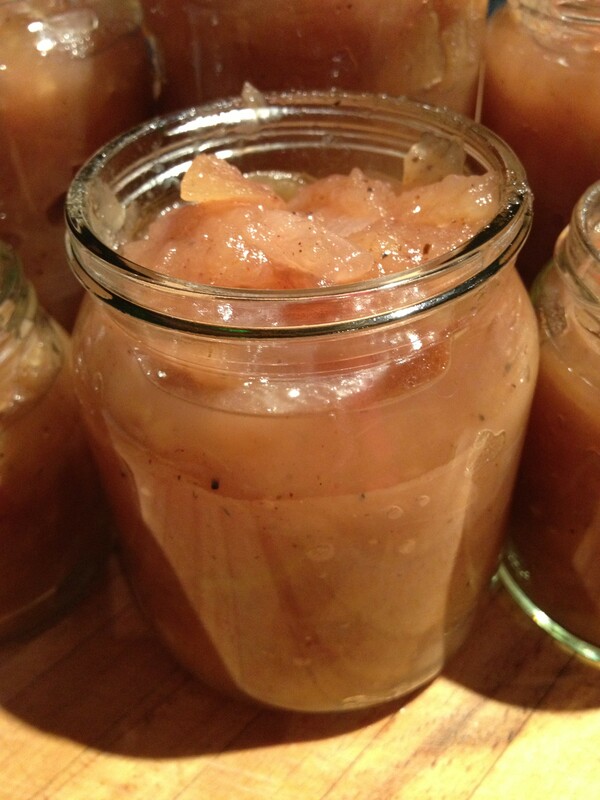 I decided to stock up on my ingredients from her and so I left weighed down with a significant amount of bags of apples and onions for my batch of relish, and other fruity treats for later in the week. 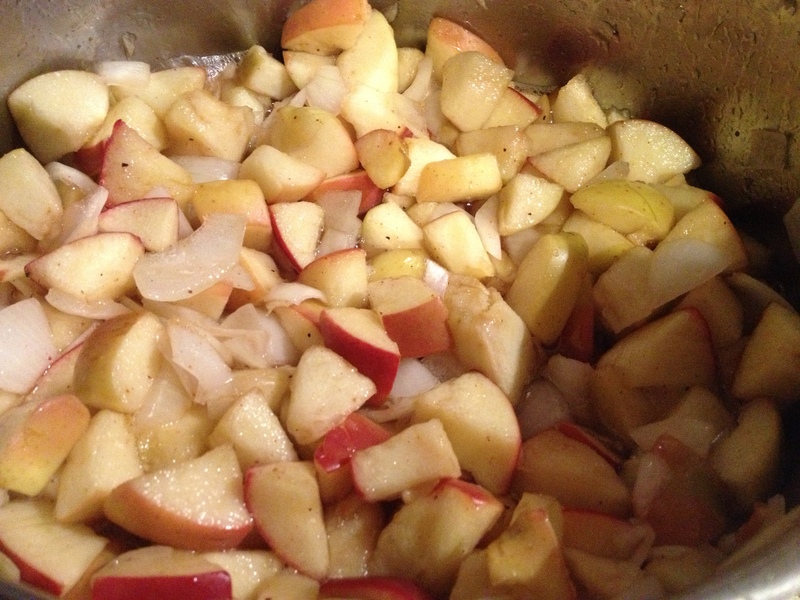 Irish apples are perfect for this as they’re sweet and slightly sour. My parent’s neighbour has an apple tree and every year the apples fall into our garden, so this summer when they start ripening and making their way into our garden again I will probably make another batch. 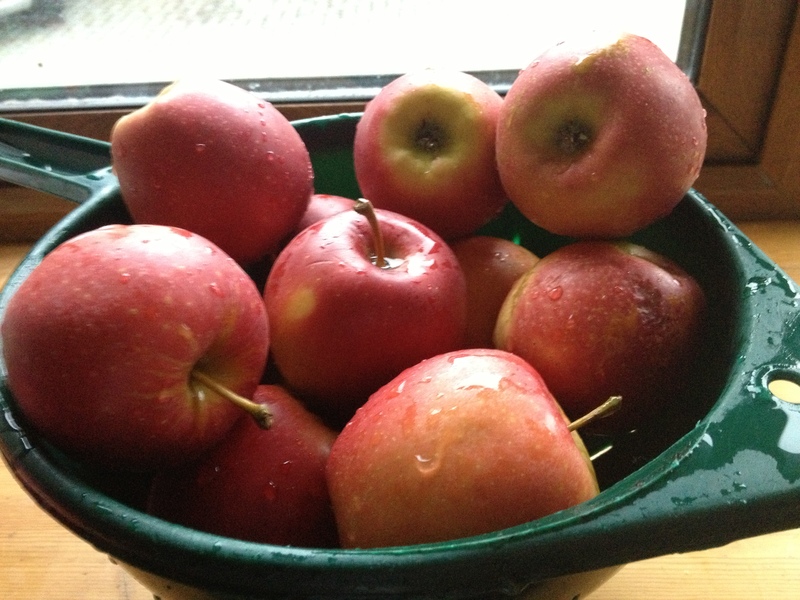 As the bad weather this Spring means that the Irish apples haven’t started ripening yet, I would buy ripe red apples rather than green, and I would go for the sweet ones that are packed with sweet juicy taste and a little bit of sour. 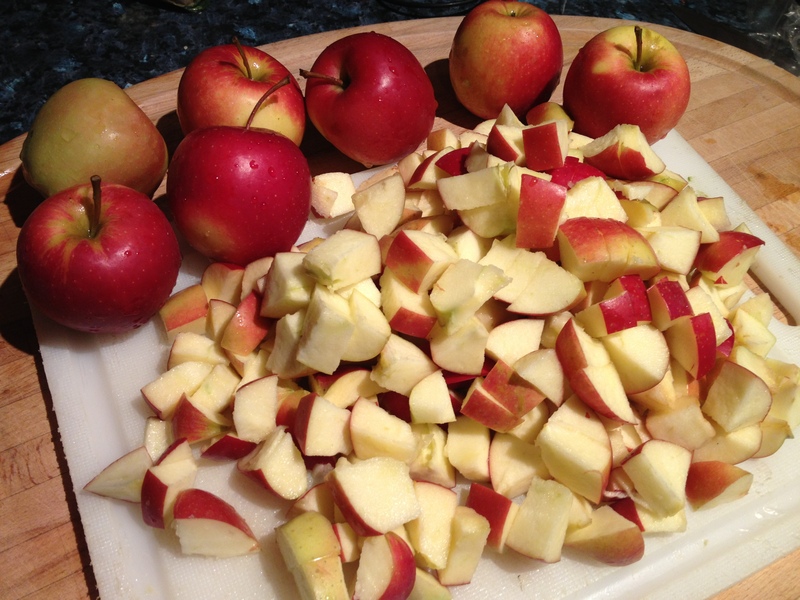 Apples like coxes work, avoid crispy, watery, flavourless apples like Fuji etc. 1. 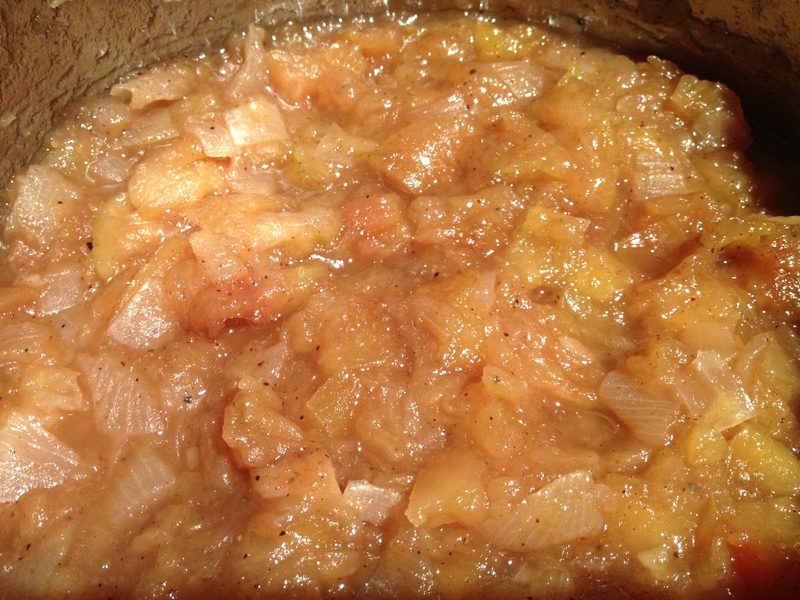 Chop up your apples and onions into small chunks and throw into a very large heavy bottomed pot and add all other ingredients. 2. Stir together and bring to the boil for 10 minutes, then reduce to a simmer and stir for about an hour. When done let cool down and season to taste. 3. Transfer into sterilised jars. To sterilise jars just put clean jars in an oven heatedto 180C for 5 minutes. Simple! This is a yummy thing to have in the cupboard over Christmas! Orange Curd, yum yum! Okay, I had never made curd before, or even eaten it for that matter but I decided to give it a go anyway. I thought it would be handy over Christmas on top of scones, with a mince pie instead of cream, at the base of frangipane tarts, between a layer of cake.. the opportunities seemed endless! I decided to make orange curd instead of the traditional lemon curd as I wanted to add some Christmas spices, and I thought that they would go better with orange. I added in one lemon though for some extra zing. It did taste really delicious when it was done, the flavours were great. This is very very easy to made. I read on-line that blending all ingredients before adding them to the pot prevent curdling, and it was true. This takes no time at all to make, and makes nice little gifts for those who appreciate a nice pot of curd! Perhaps you could splash out on some nice ribbon.. I could only find some twine left over from my mum’s Plum Pudding and so it looks a little shabby rustic! 1. Cream butter and sugar. Mix in eggs. Mix in juice. Mix in spices. (You can add in more spices to your taste if you like). 2. Heat over a low heat in a heavy bottomed pot for about 5 minutes until smooth, stirring continuously. 3. Now raise the heat to medium (never boil) and let thicken which will take about 10 to 15 minutes. Stir it the whole time. When the curd coats the back of your spoon it’s done. This is where I freaked out as I didn’t realise that it thickens further as it cools, so don’t worry too much at this point. Don’t expect it to be the finished consistency while still hot in the pot. 4. 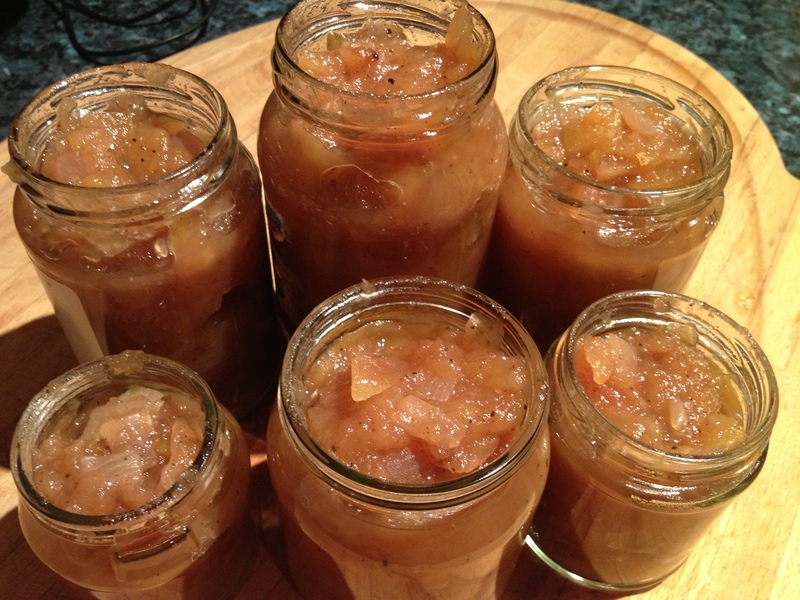 Take off the heat and pour in to sterilised jars. Let cool, then cover the top of the jar in a little cling film (apparently this helps avoid a skin forming) and put on the lids when cool. 5. Keep in fridge and it should keep around 2 to 3 weeks. There’s nothing easier to make than this tomato relish: add ingredients to pot, let stew for an hour, cool down, and now it’s ready! Ballymaloe Country Relish is my favourite and is such good quality, so I usually don’t bother making relish myself, but I thought it would be nice to make a batch and stock up with a few jars for Christmas. They make nice little gifts for people too if you wrap a ribbon around your jar. I haven’t done that myself, but it’s a nice idea for the more organised people out there! This recipe is adapted from a Rachel Allen recipe (and as a Ballymaloe cook, her recipe is probably closet to their famous Country Relish), so give it a go and enjoy. 1. Throw all ingredients in to a big pot. Let sugar dissolve and then bring to the boil, stirring all the time. Then bring down to a simmer and leave to simmer for an hour, stirring the whole time to avoid the end of the pot burning (using a heavy bottomed pot will help prevent this). 2. When done, let to cool. 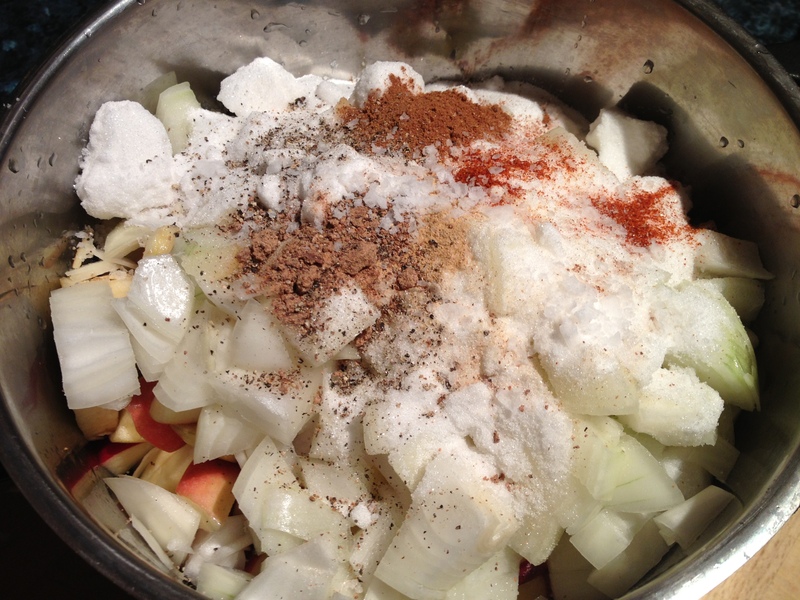 Taste and season if required with extra spices or salt/pepper. 3. When cooled put into sterilised clean glass jars. (You can sterilise them by placing them in the oven at 180C for 5 mins). Secure lids tightly. These are best enjoyed if left to mature for a week or two first, but I had some of mine that day and it was really nice too.